A Stone's throw from Slieve League. 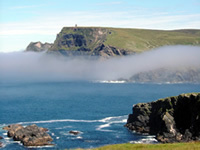 A book of poems about the area of Slieve League and Glencolmcille. 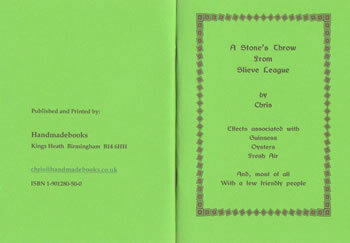 This books is available through www.handmadebooks.co.uk. Do you ever find those times when suddenly, you go into space? We three decide on the Slieve League walk. Compassing for the East Top of Slieve League. Gazing in wonder at the breakers below. Before we part above One Man’s Pass. They make for the Silver Strand and Gleanncholmcille. I return for the car, not wishing to dance the Arete.